Injured veterans are bringing a wave of change as they roll from New York to California from Sept. 8 to Oct. 7 during Soldier Ride Across America. This coast-to-coast bicycle ride marks both the 15th anniversary of Soldier Ride® and 15 years since the founding of Wounded Warrior Project® (WWP). The 3,300-mile journey from ground zero in New York City to San Diego, California has never been done before at this scale. Three teams collaborate to cover between 80 to 150 miles daily – pausing in multiple U.S. cities to interact with local communities. On top of celebrating the many triumphs of Soldier Ride during the last 15 years, warriors, families, and supporters have an amazing collective story to tell. “Beyond the physical challenge and the connection to other warriors, the opportunity to engage with the community in an era when there’s limited chance for returning warriors to share their experiences with the average person is unlike any other experience,” said U.S. Army veteran John Fernandez. John lost his left foot and right leg below the knee during a deployment in the early days of Operation Iraqi Freedom. He cycled his first Soldier Ride in 2006, three years after his injury. The collective effort of a cross-country journey of this magnitude is physically taxing, yet emotionally uplifting. It’s difficult to contain the feelings of pride and elation at the outpouring of support the warriors receive. “It’s hard to put into words that feeling you get when both sides of the street are lined with people cheering you on and there are American flags suspended from fire trucks as you ride in,” John said. Now multiply that feeling for dozens of communities that will welcome WWP bicyclists in the three portions of Soldier Ride Across America. The warriors divide the journey among three teams: East Coast (New York to Tennessee), Central (Tennessee to Texas), and West Coast (Texas to California). The three stages make the journey manageable and reinforce the teamwork warriors are accustomed to in the military. 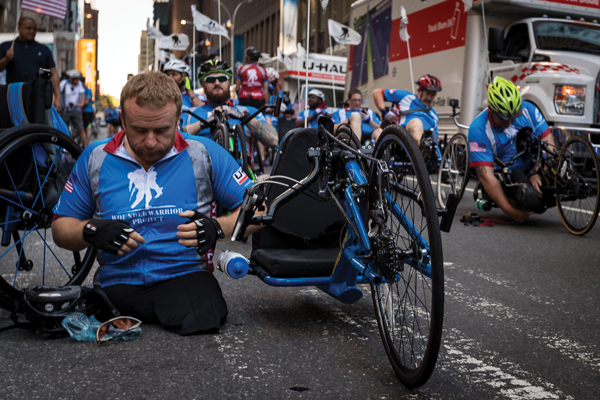 Each rider trains hard for their portion of the journey – with expertise and logistical support from WWP – and knows others are counting on their efforts to reach the finish line. John embodies what Soldier Ride is about, and why the cycling event has been so important to the mission of WWP. He was also a big part of how Soldier Ride came into existence. After John was injured in Operation Iraqi Freedom, he became one of the first warriors seriously hurt in Iraq to receive media coverage. As a well-known member of his community in Long Island, New York, John became the inspiration for a local fundraiser, which evolved into the first coast-to-coast bicycle ride in 2004. Before Soldier Ride became one of WWP’s most iconic events, there was a lone rider: Long Island native Chris Carney. He cycled more than 5,000 miles across the nation in 2004 to help raise awareness for injured veterans – after hearing about John Fernandez. The following year, several combat warriors who returned from Operation Enduring Freedom with visible and invisible injuries joined Chris for another cross-country ride. Despite many obstacles, the group of warriors refused to give up – using the experience as a catalyst to show the public and themselves that with support and motivation, anything is possible. John was physically active and was busy finishing his master’s degree in 2004, so he joined the growing group in 2006. His determination and unflinching drive have inspired countless riders since then. Most people in his community, where he has lived all his life, are familiar with John’s remarkable story. He and his wife Kristi are raising five children who are gaining an understanding of veterans’ injuries and the limitless possibilities of warriors to continue new missions as they return to civilian life. 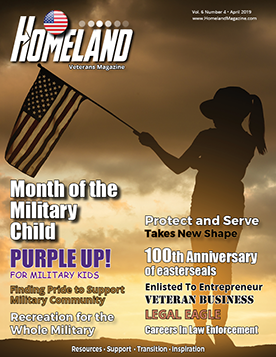 In the time of an all-volunteer military force, most service members go back to households and communities where few people around them have had the honor of serving in the military. Fewer even understand the experiences of today’s men and women in uniform. “There are not many people who share in my experience, and many times there is no forum for warriors to bring up what it was like to serve,” John pointed out. “As an amputee, it may be as simple as sharing ‘What legs have you tried?’ or talking about what you’re able to do now with a new device. In the community, sometimes people just want to have the opportunity to say, ‘Thank you,’ and those interactions are so important,” John said. The significance of encountering and interacting with people who share our experiences makes us human. The chance to introduce someone from a different background to our experiences, and now have shared experiences, is monumental to our development as a society. Soldier Ride helps our communities heal and come together collectively around a common purpose as it continues to inspire warriors in their next mission in life – a healthy recovery and successful transition to life after injury. For many individuals, the journey signifies their emerging new selves, overcoming obstacles and achieving a higher level of mind-body balance than most people have. “For me and for warriors I’ve met along the way, the opportunity to connect, to accomplish a feat together, and to share our accomplishments with others is a feeling that has no comparison,” John said. Today’s warriors are taking a stand for each other and finding purpose in the journey ahead. WWP is committed to helping injured veterans achieve their highest ambition. When they’re ready to start their next mission, WWP stands ready to serve. James Herrera is the Physical Health and Wellness director for Wounded Warrior Project® (WWP). He is an exercise physiologist and professional coach who helps drive the organization’s Soldier Ride®, adaptive sports, and health and wellness programs. James holds undergraduate and graduate degrees from the University of Texas at El Paso, where he also served as instructor in the departments of Exercise Science and Professional and Continuing Education. He is an international presenter and has worked as an adjunct faculty member with the Center for Creative Leadership for over a decade. In 2011, James served as the national team coach for USA Cycling BMX and was selected as the U.S. Olympic Committee’s coach of the year for cycling. He later coached at the 2012 Olympic Games in London. John Fernandez is a U.S. Army veteran who lost his left foot and right leg below the knee during a deployment in support of Operation Iraqi Freedom. He graduated from West Point in 2001 and was a first lieutenant commanding a field artillery platoon in 2003 when his injuries occurred. His military service earned him various awards and decorations including the Purple Heart and Army Commendation Medal with “V” device for Valor. He and his wife Kristi have five children. He has participated in Soldier Ride since 2006. • Soldier Ride Across America kicks off in Manhattan on Sept. 8. Warriors will visit numerous cities on the cross-country journey – including Washington, DC; Somerset, Pennsylvania; Louisville, Kentucky; Nashville, Tennessee; Little Rock, Arkansas; Lubbock and El Paso, Texas; and Tucson, Arizona – all before ending in San Diego, California, on Oct. 7. • Soldier Ride Across America has a 3,300-mile route – with each team riding more than 1,000 miles. • Soldier Ride Across America consists of three teams of wounded warriors representing the U.S. East Coast, Central, and West Coast regions. • Soldier Ride Across America commemorates the 15-year anniversary of Chris Carney’s historic coast-to-coast trek in support of injured veterans, which spurred the creation of Wounded Warrior Project’s Soldier Ride program.